Not the bad kind. The good kind–the kind you smell walking on the lakeshore on breezy day, putting your nose close to a baby’s head after a bath, the kind from flowers you love. Lilies can grow in containers. Mona Lisa is a tough, pretty and fragrant cultivar. Lilies are new to my garden this year, and I am awfully glad I picked up these Mona Lisa lilies (Lillium ‘Mona Lisa’) at the Minneapolis Home and Garden Show in February. Per instructions from the MSHS experts selling the bulbs, I stored them in the vegetable bin of my refrigerator until spring. I planted these, perhaps a bit early, in May. Three of the bulbs are in a pot, two in the ground. Today all of them are blooming. While I caught a little scent outside, they are reputed to have a lovely fragrance, so I picked one fresh bloom and put it in a vase in the house. The fragrance is noticeable, but not overpowering, very floral and rich. Lilies are not tough to grow. The bulbs can stay in the ground outside through the winter. I’ll move the ones from the pot to the ground after they finish blooming, although this Oriental hybrid does well in a pot. 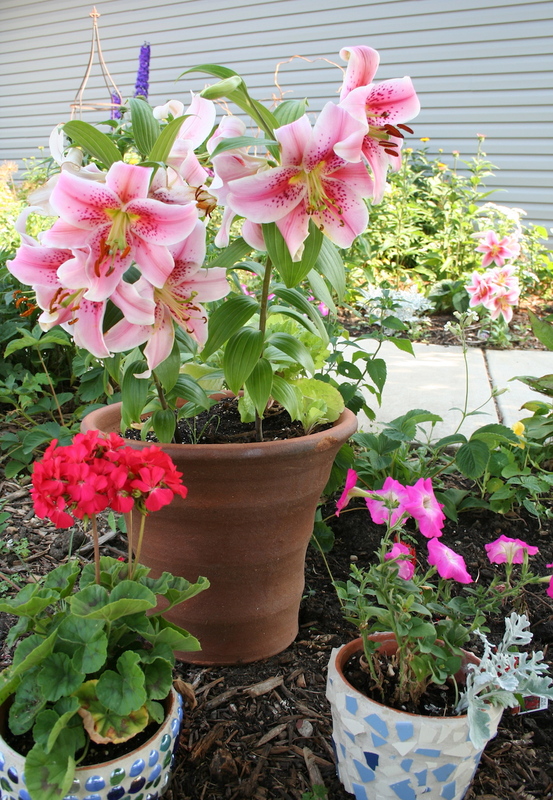 (The potted lilies are taller than the ones in the ground.) Lilies should last many years in the garden and spread a bit as they get established. I’m looking forward to many years of ‘Mona Lisa’ smells.